Almost 3 and a half pounds of alpaca fleece awaits. Isn't it beautiful? Today was my reward for two extremely busy months. 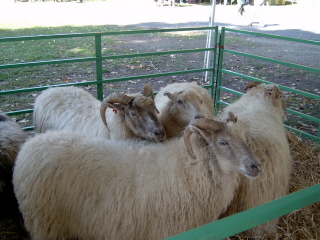 This was my first visit to the NY State Sheep and Wool Festival near Rhinebeck, NY. It was overwhelming to say the least. I've never seen so much fiber and yarn in one place in my life! There were so many vendors. I really couldn't see everything and if I had, the bank account would be much more depleted than it already is. Held at the Duchess County Fairgrounds, this is much like you would expect a country fair to be and then some. There were plenty of fleece-bearing animals on hand to see, fiber and yarn to buy (more than you could possibly imagine) and other vendors as well. We came back with pickles for Kelly, some fudge and kettle corn. There's also a knitting and spinning competition. 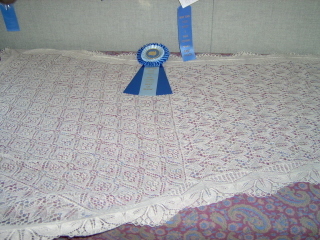 This shawl won first prize. It's absolutely gorgeous and unusually shaped. The two sides were rectangular shaped and the center section was diamond shaped. A true work of art. 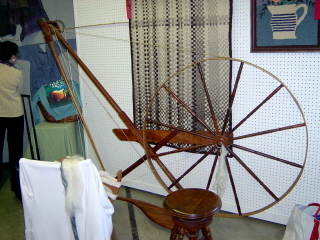 Look at this old-fashioned and rather large spinning wheel. Pretty amazing. I had read about this technique. Your eyes are not deceiving you. 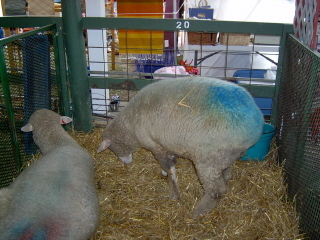 The sheep's wool is blue. 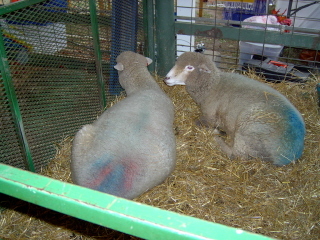 The animals are fed water containing natural vegetable dyes and their wool grows in color, eliminating the need to dye the fleece or the yarn made from it. No pictures of the buildings or vendors. I was too busy shopping. This is most of the haul. The colors are not at all accurate but that's ok. You probably guessed that the "blue" on the right there is actually purple. The gray sock yarn on the left is pretty accurate, though. I came back with plenty of beautiful yarn, including Legend from Briar Rose Fibers, which I've seen on their web site and lusted after. The color is the second one on the page, I believe, pale blues and greens. I got some wool fiber, peeking out there in the back on the left, which is in shades of red. 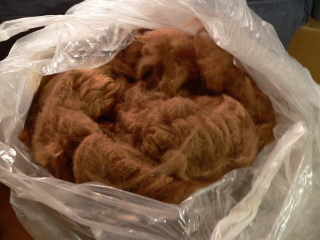 I found some lovely caramel color wool/llama/alpaca blend fiber. You can see that to the right of the sock yarn. Also, I got a lot of some charcoal gray Shetland wool, about 18 ounces of that. The knitting needles in the picture are handmade, wood needles that are square. I was intrigued but not convinced until the vendor invited me to try them. 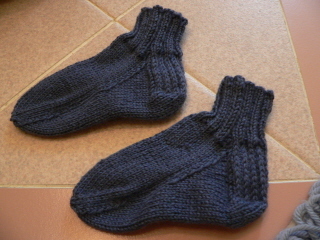 They're really lightweight and comfortable to knit with. I thought it would be awkward knitting with them but I was really surprised. As I was waiting to buy them, a woman walked up next to me and expressed doubt about square needles. I said, try them! She did and said, "Oooh, these are nice!" She bought them, too. The basket in the picture was one of the first purchases. It's handmade by a couple from Ghana. It's beautiful. 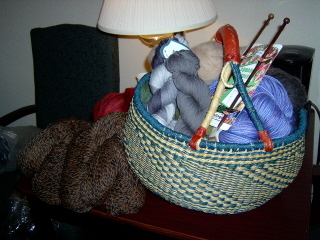 Bill said he can picture the basket full of yarn on the hardwood floor of my little room at home. People asked all day where we'd found it. One thing I thought about buying but was a little unsure about was a fleece, a whole fleece. Well, not only did I get one, it's not even wool, it's alpaca. 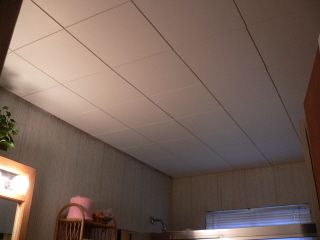 It's a beautiful coffee brown color. As we were walking over to the table, Bill said, "I like that color" and not even knowing which one he was talking about, I put my hands in the bag of the color he was looking at. It's not as dirty as I thought fleece would be. It's so soft. I will definitely have to hold onto it until I practice on the wool I have but with almost 3 and a half pounds, it will make a lot of yarn. Other things going on in my life include working.... a lot! Next week is the last week of the ASL class and I'll be so happy to get my evenings back. I've missed two meetings of the spin guild and I feel like I have so much to learn. I hated missing anything. I've settled into the routine at the high school and getting up at 5:00 am isn't as hard as it was a month ago. Sue and I interpreted Sweeney Todd on Thursday evening. I was really nervous about this one. Actually, I always feel like I haven't prepared enough but we're getting much better at this and I don't need to prepare as much as I did before. Even though I only spent a couple of days on the script itself, I'd listened to the cd for over a month. Apparently, that helped because it went really smoothly. I felt energized and accomplished when it was over. 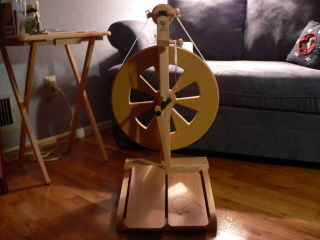 As life slows down somewhat, I have lots of project and activities to keep me busy. We're on our way home tomorrow morning and back into the routine. 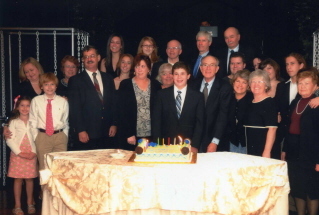 Here are some pictures from Steven's bar mitzvah last Saturday. 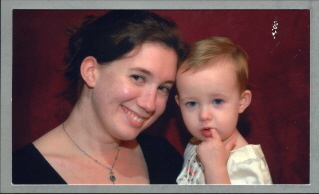 We had lots of family visiting from around the country and LOTS of pictures were taken. There will probably be more to follow. 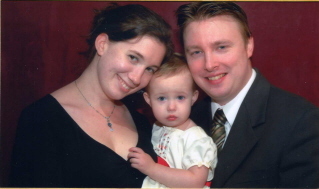 Along with the photographer who took family pictures, they had a photographer in the lobby who took photo favors. You could have pictures taken, they'd print them and put them in frames, as many as you wanted. It was really nice. 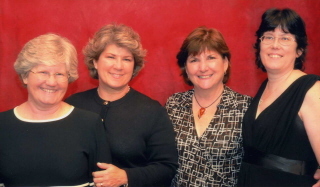 The McIlree cousins. Note that, at 5'4", I am the tallest. The cousins and family who traveled from outside of NY to be there for Steven. Some of these people, he'd never met. 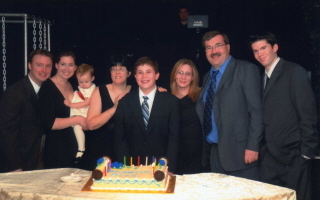 Honig family, Steven's candle lighting ceremony. Lorelai was a bit overwhelmed by this excitement. Needless to say, I've been incredibly busy but it was such a blast to have everyone here. We had the best time! Whoever built this house was either in a hurry or perpetually confused. Yes, the doorway is at an angle. Having done this before, I know how much fun the molding will be. 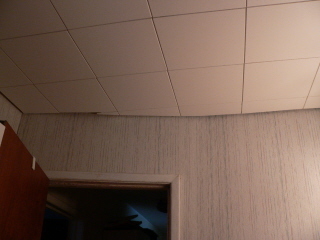 But the ceiling looks great. More Lorelai socks. I do love them. 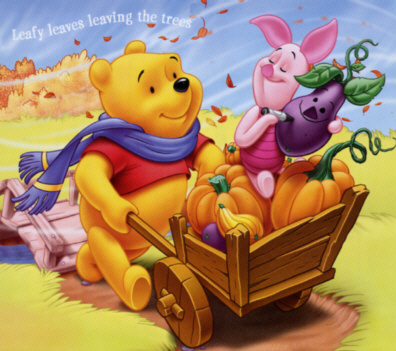 Eeyore and Piglet say happy fall. Ta-ta! It's October so...why is it so warm? Warm and muggy doesn't quite fit this picture. I'm optimistic, though. I have a fall wreath on the door! Well, as of this week, I'm working full time in Smithtown High School. As for the circumstances of the situation, there isn't much I can say, ethically. The deal is, though, that I'm working there and still teaching two nights a week until the end of this month. It was difficult to get into the swing of things since I didn't have time to prepare. And since I am the organized type, I do like to prepare. I like the student, though. He's a good student, does his work on time. All I have to do is interpret, which is a relief after the two years I had in my last job. The population is better as well. Waking up at 5 am again isn't pleasant but I am done at 2:00 pm and that's not a bad thing. Of course, this has seriously curtailed my knitting progress. I'm working on a shawl that I'd like to finish by next weekend for Steven's bar mitzvah. What are the odds that will be done? My money is on not, frankly. I do have other shawls I could wear but this one matches the dress, or rather, the fabric of the dress I'll make on Monday when I have a day off. Wait till the last minute you say? Well, I didn't realize I'd be working all these hours when I made these plans. Ah, well. My peaceful days in my cozy little room are going to be few and far between, I'm afraid.